Joel Goldsmith studied the spiritual literature of the world and he writes, "Insofar as I have observed from my study of the spiritual literature of the world, the truth stated in this book has never been fully revealed before, yet it is the absolute basis for true spiritual living." The Thunder of Silence is based on the principle that there is an inner Grace available to all that does not operate through or by physical might or mental powers. Most people are not aware of this Grace, but when It is consciously realized, it will bring into expression everything that is necessary to our unfoldment. But, Goldsmith says, there is a price: this Grace operates only when we are willing to relinquish faith in anything and everything less than God – even faith in the "God" the world thinks it knows. In the first part of The Thunder of Silence, Goldsmith presents the vision of this spiritual way of life and invites the reader to come into the awareness of the abiding Presence within. In the second part of the book, he treads confidently into the often puzzling subject of mind, answering the many questions that always surround that topic. The whole secret, says Goldsmith, lies in "making the transition from a thinking human mind to a mind at rest in a state of awareness." In the third part of the book, Goldsmith gives the reader an illumined interpretation of the Sermon on the Mount, which reveals the innermost secrets to attaining the realization of the Presence within. Effortlessly relating the Infinite Way principles to this extraordinary teaching of Jesus, Goldsmith works extensively with its challenging passages and reveals their deep meanings. He shows how practicing these ancient principles can help us to live in the world, but not of it. If we are fed by meditation in the blessed Silence that thunders with Truth, he says, we can live by the grace of God as the Light of the world. 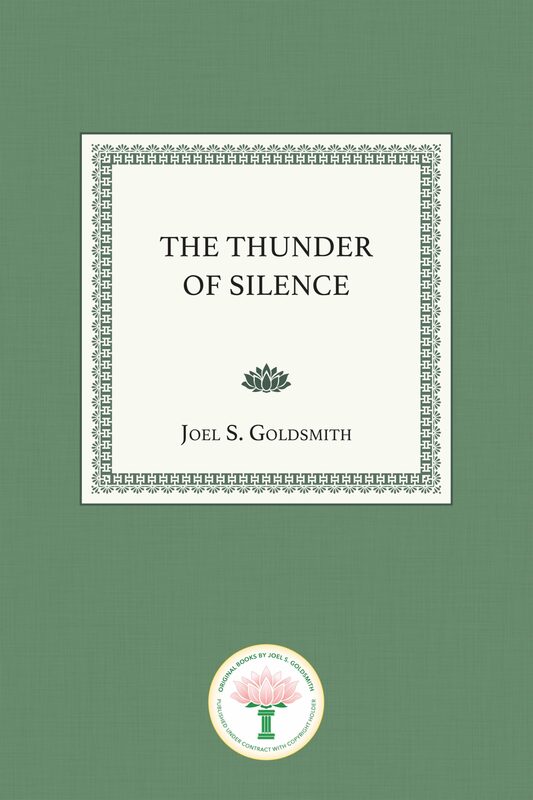 Speaking about The Thunder of Silence, Goldsmith says, "It is a radical book. It will blow sky-high concepts of God that have been built up over the centuries." But he cautions: "Readers of this book cannot expect that the mere reading of it will enable them to live by its revealed principles. Those who feel a thrill of recognition in their first reading should make this book their constant companion day and night until their materialistic state of consciousness begins to yield." The Thunder of Silence will surely be a great help to spiritual seekers who want to reach that state of consciousness in which they can truthfully say, "I live, yet not I, but Christ liveth in me.". Otros ebooks de JOEL S GOLDSMITH.